This restaurant is permanently closed. Alchemy is a craft bar and restaurant nestled in the heart of West Seattle"s Junction neighborhood. The idea of the alchemist is a person obsessed with the perfect fusion of science and nature with just a hint of the intangible. Our hand-crafted cocktails and inspired menu of shareable plates will have you experiencing a wide variety of tastes and sensations and yes, just a few aspects you just might not be able to put your finger on. We look forward to serving you soon! 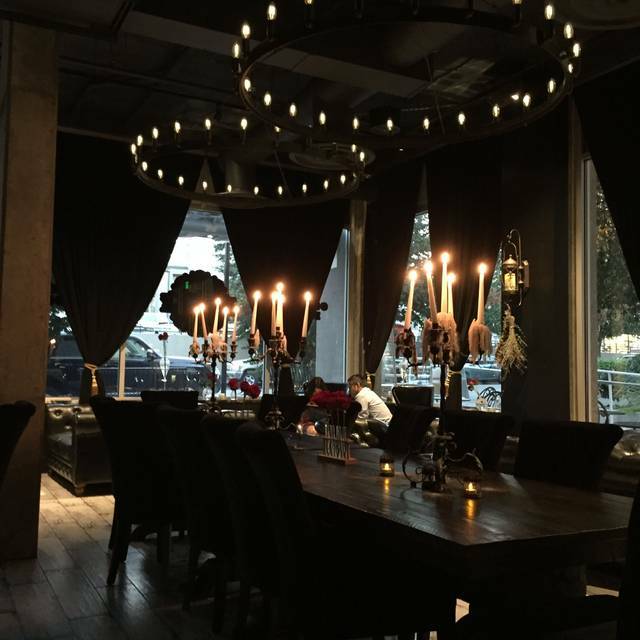 Nestled in the West Seattle Junction with ample parking you will find Alchemy, A delight to all of your senses. This upscale cocktail bar with approachable yet elegant cuisine it is sure to wow your group and impress even the most sophisticated tastes. rye, demerara, angostura, peach bitters, house made funky orange bitters; stirred, smoked in a beaker, poured over large cube, by you! Alchemy is CLOSED, not that their website says so. We walked up to the door, only to find a sign saying they had been evicted by the sheriff’s department, and that anyone on the premises was trespassing. Then, because we were right on time for our “reservation,” I couldn’t cancel on Open Table and book something else. We found another place, but it was frustrating. This Restaurant is permanently closed; OpenTable should not allow any reservations to be made. Thank you. Restaurant is closed. F2T was evicted for failure to pay rent. It’s been shut down by King County detectives for lack of rental payments. We loved Alchemy! The food and drinks were excellent and the Server was friendly and attentive! The atmosphere is the best, dark and romantic! We will be back!! Innovative cocktails and good wine list. Small bites and entrees feature inviting, creamy sauces and flavors. Alchemy is by far my favorite bar in all of Seattle. 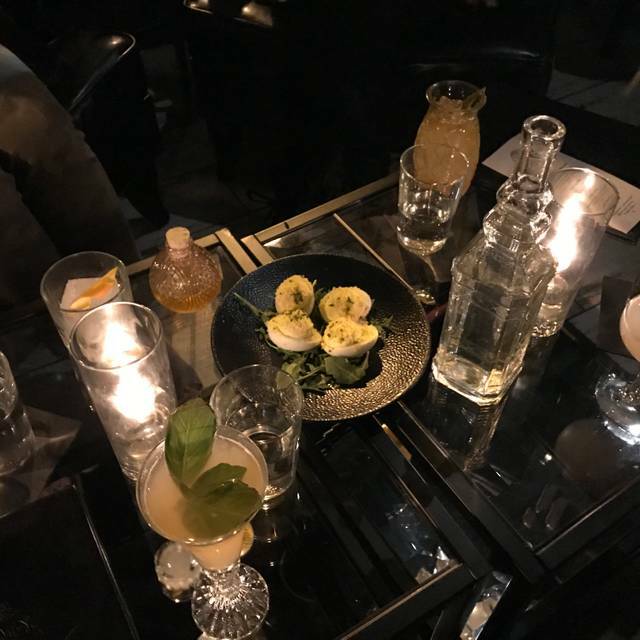 It’s very difficult to find a craft cocktail bar where every drink is crafted well for effect as well as taste, and Alchemy achieves it and then goes above and beyond. I have brought several friends here and everyone loves it, and it’s become my cocktail spot. The ambience is perfect for feeling extra cool and the staff is always personable and incredibly nice. The food was pretty good and creative. However we would not come back: music so loud we had to yell at each other to be heard. We very respectfully asked if they could turn down the music and although they said they would find a different style of music; it was just as loud. Just not worth it for a dinner date. Unexpected atmosphere in what is a new building. Great design, great furniture, lighting, etc. It's a little dark at night but overall a cool place. Service was pretty slow when we were there (and it wasn't busy). Food was just ok. Overall a good experience. Food was solid, candied bacon should be mandatory. There were some cheeses that were well into the Foot range of cheese taste and smell. Service was perfect and the drinks were on point. They’d run out of several things on the menu (it was a Friday evening), with it not being an extensive selection to begin with we were slightly disappointed at this. Good service though and fun ambience. Not sure if we’ll make a point to return. Some friends & I have wanted to come here for the last year+, and two of us finally did it for my mellow birthday. It was worth the drive from the south sound--we will be back. The owners showed genuine interest in their patrons. The food & drink is spectacular. We had a lovely evening celebrating our anniversary at Alchemy West before attending a play. Drinks were amazing and the food was delicious! Service was excellent by all staff in a unique themed atmosphere. We'll be back for sure. Service was slow and wasn't the dinner/date night we were looking for. Best for a cocktail and go type place. Music was too loud and it was too dark - had trouble seeing the menu. What a wonderful place for a friend get together in the neighborhood! Specialty cocktails are top notch. Staff is friendly and attentive. Highly recommend! Alchemy was a nice little restaurant located in Murphy’s. We sat outside and they had a solo artist playing baby boomer music. We enjoyed the atmosphere and the food. We especially enjoyed the green curry muscles which were delicious! One of my favorite West Seattle spots! Fantastic drinks! It IS handcrafted so be aware that it might take a bit longer than typical chain restaurants to get your drink out to you. But is is worth the wait! The service was somewhat slow because there looked like to be only one server, but the bar tender was very kind and offered free birthday shots for my table since we were waiting for so long. Really fabulous cocktails created by Scott and his staff. Tasty salad and asparagus! Delicious sliders!! Fun and comfortable chairs and couches . Plenty of tall chair sitting with tables. A really good time !! Fantastic drinks and delicious food! Our server was helpful and extremely knowledgeable about the unique drinks menu, and spot on with his recommendations. 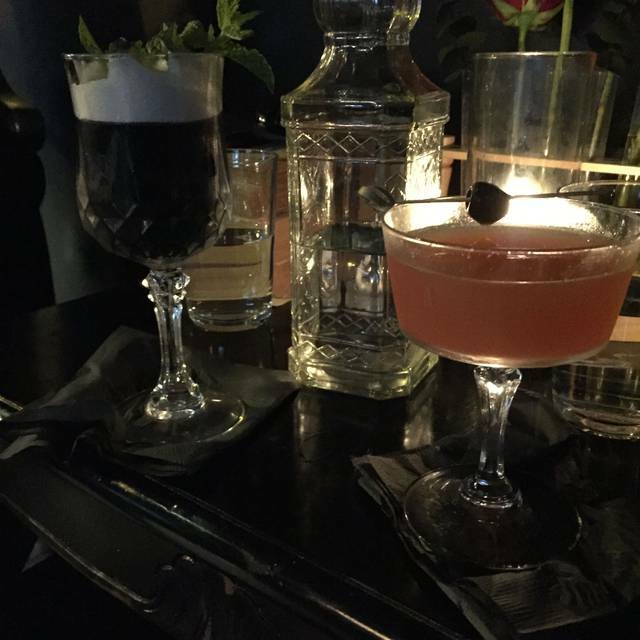 The bartenders made perfectly tailored custom cocktails, in addition to drinks from the menu. The creativity and presentation of the cocktails is astonishing! Shared small plates were tasty, and the kitchen kindly gave our table of five an extra portion of things that came in fours, such as the bacon candy, so that everyone would have a piece. A great place for a very special cocktail hour! 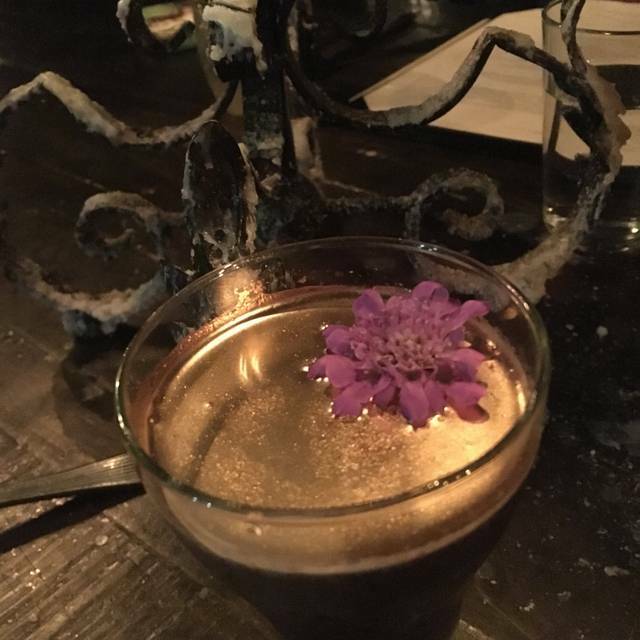 Alchemy has great cocktails, the staff are very friendly. I would go here for the cocktails and eat somewhere else as the food (hangar steak-$19) is pricey and will leave you still hungry. Alchemy deserves to be a lot better. My biggest gripe is the cost of the cocktails. 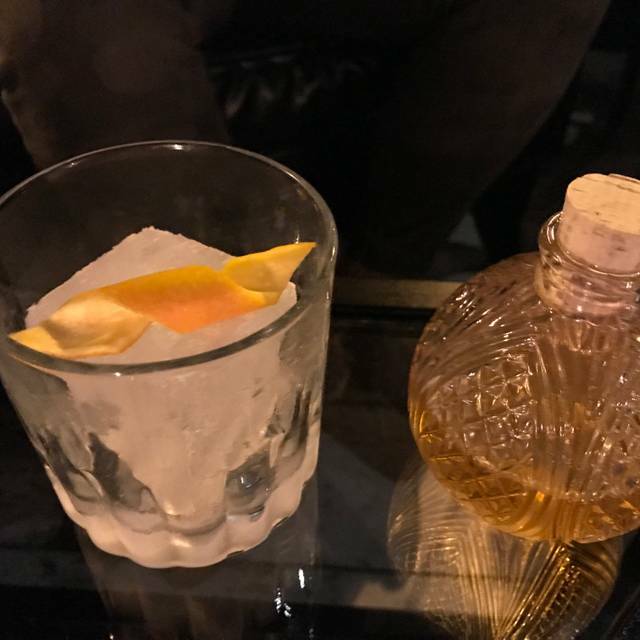 While it is notable that handcrafted cocktails should and do cost more than a simple mixed drink, $16 for what Alchemy is offering is $4 too much. Additionally, during this visit, the patrons who were seated before us had tipped over some glassware that shattered on the floor and instead of cleaning it up it was simply swept just out of the foot path and left during service. The deviled eggs were good and priced accordingly. I want to love Alchemy so much and hopefully they can address the few areas where they are currently missing and this place could be a gem of the West Seattle. Great, creative drinks! 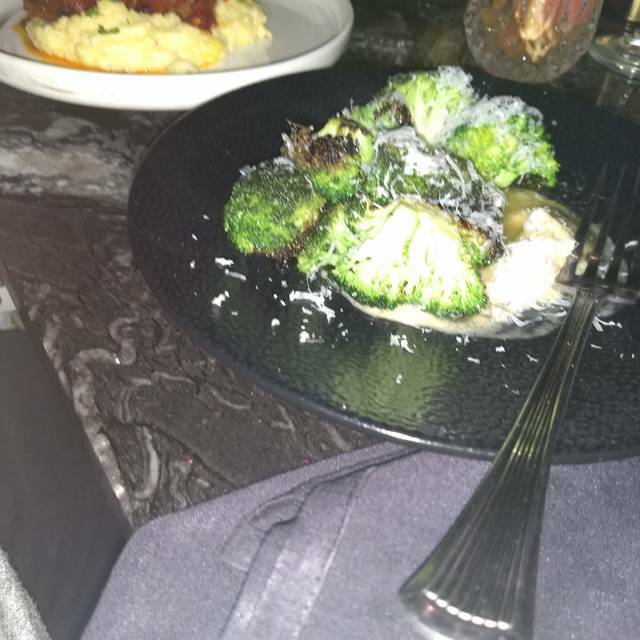 Food was poorly presented and seasoned, and quite highly priced. The server/hostess seemed way overburdened with tables and it was hard to get our snacks in a timely way. I would say yes for an occasional drink, definitely skip the food. The place is very cool looking. Was not very busy. Comfy Chairs. I did get annoyed that my order was messed up. Waiter does not have a note pad, so he did ask me about 6x times what I order. Which was one menu item. Food took very long. And again, he came back several times to confirm what we got...one menu item..so not sure if he put it in right away. My drink was wrong and he got my dates wrong too. My bill was also wrong. And it that was kind of annoying. We were very nice...but it still was very very annoying. I told my friend and they seemed to have a similar experience. It must be because its fast pace, too loud or too new to have all the kinks worked out. Not sure. But its sad...cus place is cool. But I wont go back. Id rather go near by...get good service for cheaper. I never leave bad reviews. But this was just horrible. Tried Alchemy for the first time on Friday 22 June 2018. I arrived early so I enjoyed a craft cocktail at the bar. When ordering I requested the bartender's choice and, after a quick interview about my preferences, created an rum based drink with celery seed bitters and an absinthe foam, garnished with a lemon twist. Second route was a standard capirinha which was actually a little flat compared to what I've gotten at Novilos or other Brazilian restaurants. Third round was Moscow Mules which were perfectly cromulent. Some issues with service-- drinks, even when identical and ordered together, came separately (by 10 minutes) for me and my date. Same with food, including appetizers and mains. They've got a few issues to work through. The atmosphere is great. Cocktails are good, especially when you're looking for creativity from the bartenders. Food portions are small but the prices are reasonable for the size. Overall it's worth going for dates or special occasions, especially if they get their service in order. Presentation is a big deal here. Don't expect anything understated. 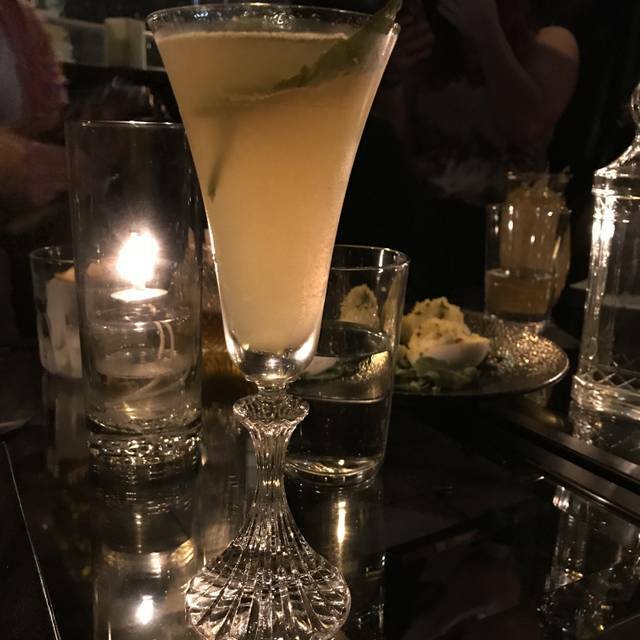 Cocktails are decent, and service good. To be fair, it was their one-year anniversary, but the service level was not there. Seeing how they handled a special event makes me know to never use this venue as a location to take my high-end clients for cocktails and food. They claimed live music and free appetizers, but no free appetizers and their “live music” was a DJ... they also gave our table away and told us we could sit at their cluttered bar. Overall, I’m disappointed. The service was incredibly slow even though the restaurant was empty. The food was decent but way over priced. The server didn’t seem new but repeatedly forgot things we had asked for and they played reggae music nonstop which appear to match the vibes of the bartender better than the bar. We tried coming on a weekend night before and the bar was slammed, so we decided to make a reservation for a weeknight birthday at a later date. When we showed up for our reservation, the bar was just as busy and it took 5 minutes for us to be greeted. There was no table or bar seats ready for us, and the waiter said he could find us seats in just a few moments. 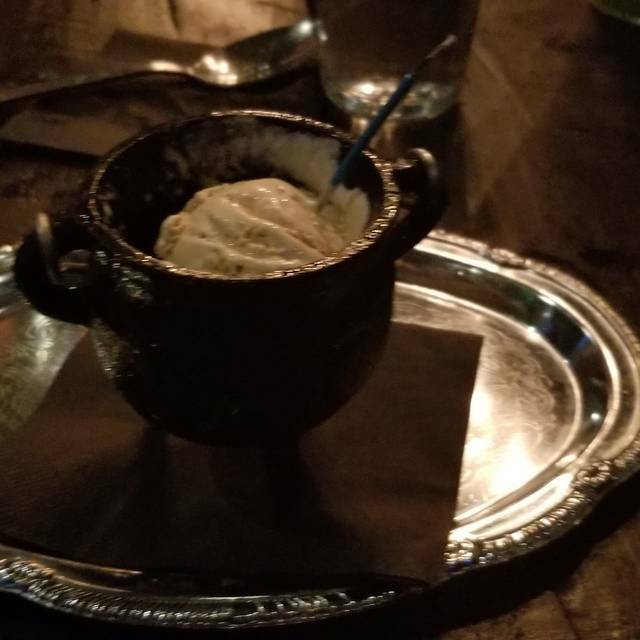 We ended up sitting at the bar and enjoyed chatting the with bar tender and other patrons, but our efforts to place a reservation in advance and notify the bar that we were celebrating a birthday didn't seem worth it. Dev, our first server, was great. The drinks are fantastic - if not a bit pricey. The reason for three stars is because of the price factor, and more importantly, the server who took over for Dev when he was cut from the floor. She was rude, inconsiderate, and took an hour for the 8 of us to check out. Our checks were completely mixed up, and when we tried to correct things, she was obviously put out. We will be back, but it will be awhile. Nice décor. A mix of seating, leather chairs, couches, tall tables, and bar seating. Great cocktails , tasty food. loved the deviled eggs. Had someone in the party that doesn't necessary like them, but they really had a more savory taste the any I have had before and I think that is why the person who usually skips them was wanting more.